Head Mixologist at Studio Bar, Michal Golecki, shares his recipe for the exclusive -Sangre Mexicana' Mezcal cocktail available at K West Hotel & Spa until 31 August 2017. 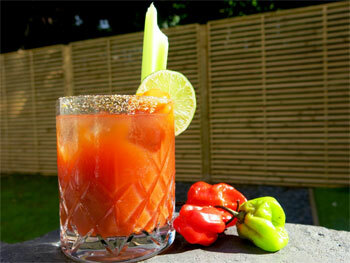 The -Sangre Mexicana' is a classic Bloody Mary with a Mexican twist. The cocktail is mixed with La Penca Mezcal instead of vodka, and with chipotle instead of hot sauce. -La Penca' Mezcal, made from 100% Agave, is aged in 220-litre American White Oak barrels for approximately two to six months. Add a handful of ice cubes into the glass you will use for stirring. Add the Mezcal, olive juice, Worcestershire sauce, orange juice, salt & pepper, chipotle sauce and tomato juice to the glass. Stir thoroughly so all ingredients are mixed together. Rim an Old Fashioned glass with some lime and celery salt. Put some ice cubes into the glass. Pour the mixture over the ice and fix the wedge of lime onto the rim of the glass to garnish. ¡Salud!